Do you have those moments where you just really want a good dessert but don’t have a whole lot of time for baking? I will freely admit, with our busy schedule, that is me a lot of the time. It isn’t that I don’t like sweets, quite the opposite, but it feels like I never have time to truly relax and bake in the kitchen. This is why I try to always have quick, yummy recipes available when my husband or I have a sweet craving. Recently though, one of my friends – David from Food N Service shared with me the most delicious chocolate brownie recipe that sounded absolutely amazing – his Double Chocolate Crunch Brownies. Of course, as a girl who absolutely loves chocolate, I HAD to have the recipe. I mean, come on, how can you not drool at the screen just looking at these brownies? What shocked me even more when I had the recipe was that they were just so easy to make! When I mean easy, I mean a grand total of five minutes prepping ingredients and 20 minutes of baking. This means you can have a delicious dessert ready for your family or for a work party in a matter in a half hour or less in the kitchen. What made me even more excited was David giving me permission to share this wonderful recipe with all of you guys. He even took some truly amazing pictures of them too for me. If you are anything like me, you are probably excited to try this yummy recipe for yourself. Oh, and don’t worry, you probably don’t have to make a special grocery trip – all the ingredients are things you likely already have in your pantry. Are you ready to check out these yummy Double Chocolate Crunch Brownies for yourself? Just read below to check out this scrumptious brownie recipe! Are you looking for a rich, chocolate dessert that is pretty easy and fast to make? These delicious brownies are super easy and take under 30 minutes to make! Preheat the oven to 350 degrees. Grease and flour a 9 by 13 baking pan. In a bowl mix the melted chocolate with the butter and sugar. Add the eggs and mix for 30 seconds. Add in the flour and lightly mix until everything is well incorporated. Remove from oven. Spread some melted chocolate and top with the crushed Oreo cookies. Tips: They are super fudgy and chocolaty. Serve them warm for a sticky fingers treat or cold for a more fudgy dessert. Serve them hot with a big scoop of vanilla ice cream for the ultimate indulgent treat. Those look amazing! I might have to try and get someone to make me these! Wow! These are impressive. Brownies are my favorite. The moist chewy brownie plus the melted chocolate plus the crunchy topping is the perfect combo of textures! These brownies look delicious and I would like to make them. These look like I would crave them! How delicious! This brownie recipe sounds to die for, definitely going to be making these. Happy Dessert Day. I am a chocoholic and these look so good!!! These would make a good bake sale item. A little bit fancier than a plain brownie. This looks soooo good, I’ll have to give it a try! These look delicious! I will be trying them soon. that does sound easy and looks yummy .want some. You may be right about how quick these are. And they don’t take a lot of items. YOU HAVE ME AT CRUNCH AND I MUST SAY I NEEED TO MAKE THIS ASAP FOR THE FAMILY. Oh wow!! this sounds amazing, I am not one for eating up chocolate but this makes me want to eat. Love the recipe. These have my mouth just watering. I am going to have to try making these, saving recipe. Wow – that looks rich! This recipe looks really yummy. I will be putting this in my recipe book. Oh my!! This looks like HEAVEN!! Deeelish!! I love the crunch! Such a perfect texture change! Oh my Goodness! These brownies have chocolate and chocolate and MORE chocolate and I want to eat one now. I have to make this recipe. Wow these look so good! I love the addition of the oreos on top! I have a bake sale for church coming up and need a new recipe. I think this one would be a hit versus just plain brownies. Holy moly! These look amazingly delicious! I’ll have to bring these to our Thanksgiving dinner on Thursday! That looks delicious! I love all things chocolate, and easy is a nice bonus. I’m going to try it soon! Oh Yummy! I need these right NOW! You had me at 5 minutes prepping, but the picture really sold it. My brother in law would love these. The only dessert he eats is anything and everything chocolate. Wow! These look so tasty! Pinned and can’t wait to make it for my family! I love the crunch of the Oreos. Thank you for sharing. Its getting close to us to start our baking. We will have to try this out. I LOVE brownies and these look amazing! My kids really like oreos too so I think these would be a hit. That looks and sounds good. Perfect with a spoon of vanilla ice cream. My family and I love double chocolate cake. The crunch make it sound so good to eat. Oh my these look delicious. We are a brownie loving family. The more chocolate the better! Thanks for the recipe, I’m always trying new brownie recipes, this one sounds promising! These look so yummy! These will be great to take to school for staff treats. My wife would love these. I’m off work today and this would be a great way to show her my appreciation for all her hard work. Chocolate is it’s own food group. Brownies are my weakness! And who doesn’t love oreos?? These look like chocolate heaven! I love chocolate. I also love brownies. I also love crunchy dessert, so this is ideal for me. OMG this looks so good and yummy. I’ll have to try these as they look soooo good! Thank you for sharing! These sound really good–I’d love to try them. 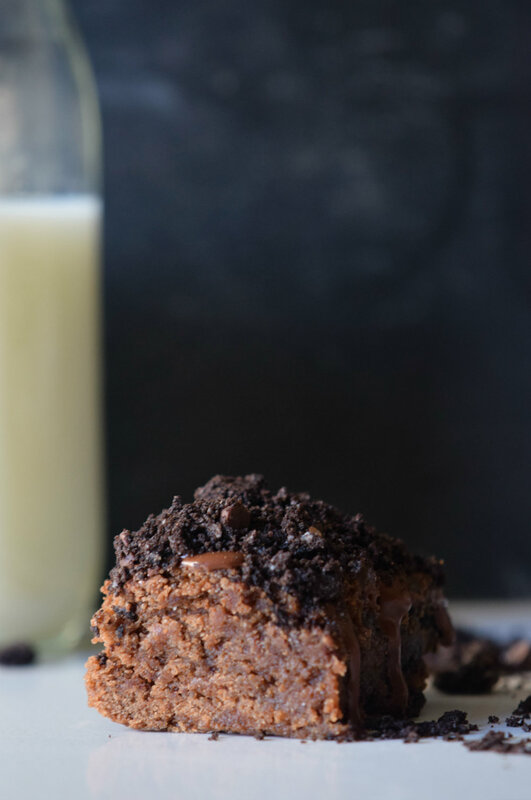 Brownies are my favorite dessert and oreos are my sons, so this recipe is going to be a hit! These would not last long at my house! They look delicious! This looks so delicious. I love anything that is chocolate. This sounds so good! I think I’ll make it! These look great!! I think the crumbley part on top makes them look extra tasty! Definitely something I’d love to try! Now this is something the whole family will love. Thanks so much for this. I will make it tonight.. Such an awesome recipe! I can feel my blood sugar skyrocketing just reading it! These look so good. Right now I would want one hot out of the oven. I like brownies and how you can have them moister or not. My mouth is watering! I am going to have to put together a shopping list for the next trip! I pinned this because I want to find it again! They sound delicious! I love brownies! Anything with double fudge is heaven to me. I would love to make and try these. It looks so rich & chocolaty! I definitely would love to try this. These do look unbelieveably good! They may need a danger sign. Oh, I must try these! Brownies are always good on their own but Oreos couldn’t hurt the recipe. I know it calls for 6 on top but I tend to go over board so I would use chunks and even more Oreos. Chocolate desserts are the best. Oh my goodness, this is the best looking picture I have seen in a long time! These have to be full of calories and fat and I must have one! These look so delicious!! I will definitely have to make this for the family for a dessert one night, yum!! The Oreo topping makes this super special. I love adding a little crunch to a soft dessert like this. What a nice treat. I’ve been craving brownies lately. I love the idea of putting Oreo’s on top, yum! These look fabulous–ty for the recipe! I’ve bookmarked this. 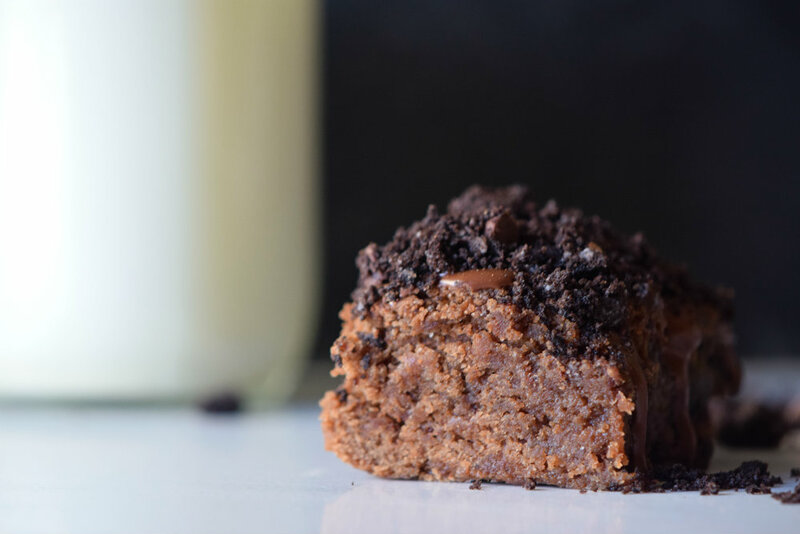 Because the Double Chocolate Crunch Brownie looks as delicious as it does, I can’t wait to try this special recipe out. I only hope I will be able do as good as you did in the heartwarming photos. I must try these! Brownies are my fave! Ultimate dessert for the brownie chocolate lover. I have be a brownie-lover forever! I especially like this recipe because it is home-made yet not as time consuming as typically as “from scratch” can be. These brownies look and sound delicious. I am definitely trying this recipe. You had me at ‘double chocolate’ and ‘crunch’. This will be perfect for pairing up with vanilla ice cream! I’m a chocolate lover, too. These look amazing! I love the sound of this. 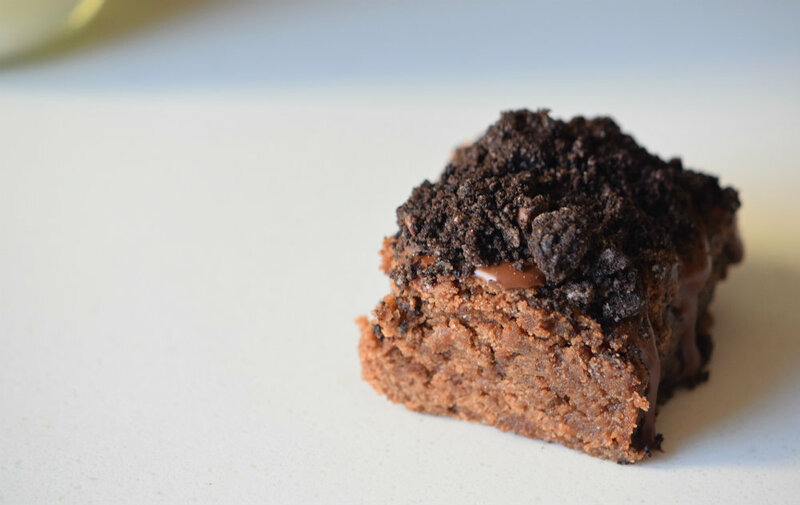 I love my brownies gooey, but adding the crunch to the top is just perfect! Im so excited to try them! Really tasty looking recipe. I will make this for an upcoming birthday party. Great recipe but probably needs a warning with the number of calories listed; I think at least 50 calories have wafted there way down the internet to me for just reading the recipe! I love my grandmother’s brownies. but she cooks them differently! Surely I will also suggest this exquisite recipe! Omg this looks super yummy! Will have to try this out in the summer! Who doesn’t love brownies, yummy. This looks so good! I think I would drizzle a little salted caramel on top! UMMMM yes please! These look so scrumptious! Gotta save this one to try since we’re due for a chocolate dessert! My husband would love this. He is a chocolate fiend and likes brownies. Our anniversary is coming up, maybe this will be on the menu! I love whenever crushed up Oreo is used in dessert. That flower pot Treat is of course very famous, and the kind used as pie crust is very enjoyable as well. I’m looking forward to the decadent combination of the two textures! And, of course, all that chocolate. Thank you for sharing your recipe. This looks delicious. I love easy, I love fast and I love brownies! This recipe looks like a win – win to me! To be honest I have tried so many recipes and none have been as good as the Ghirardelli Triple Chocolate Brownie Mix, it would be great if this was one that would finally get the boxes out of my cupboard!